← Communication: Saying yes or was it no?! In some ways native English speakers have it very easy. I suspect that English has many more of the Romantic language words that any other Germanic language has, as well as all that Germanic background with its vocabulary. 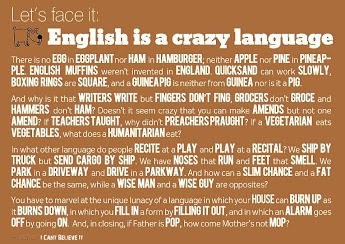 It’s a pity that other languages are not given enough emphasis in many sections of the native English speaking world. So many of those weird English exceptions can only help a native speaker learn other Germanic or Romantic languages.